Re: What SOC% does each bar on Leaf dash represent ? RegGuheert wrote: That's a useful tip! I will assume this applies only to "like new" batteries. I assume so as well. I 'estimate' I've lost between 5-10% of original capacity based on a perceived drop in range when fully charged. I don't have a GID meter so I could be way off. Is there any way to display time to 100% charge on the dash if the charge timers are set to 80%? Otherwise, what would your rules look like for time to charge to 80%? 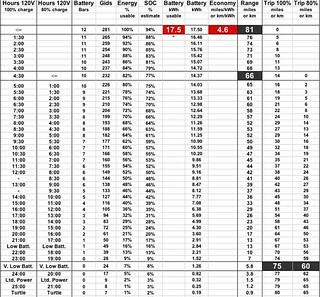 Should I simply subtract 3:30 from all of the numbers since that is what I read on Carwings after a charge to 80%? RegGuheert wrote: Is there any way to display time to 100% charge on the dash if the charge timers are set to 80%? This is a pretty old thread... but I was wondering if anyone has made a decal to go over the dash display lining the SOC % with the bars? TOPleaf wrote: This is a pretty old thread... but I was wondering if anyone has made a decal to go over the dash display lining the SOC % with the bars? I had thought about that, but a Gidmeter makes the entire fuel gauge redundant. Has anyone noticed that the first 2% SOC seem to be used (100,99) faster then the lower % SOC? I can usually only get a few tenths of a mile on the 100% reading, and maybe a mile on 99%. Below that it goes to a normal "range" where if driving conservatively, I can get 1.3-1.5 miles per percent SOC (20-35 mph with slow acceleration). DougWantsALeaf wrote: Has anyone noticed that the first 2% SOC seem to be used (100,99) faster then the lower % SOC? I can usually only get a few tenths of a mile on the 100% reading, and maybe a mile on 99%. Below that it goes to a normal "range" where if driving conservatively, I can get 1.3-1.5 miles per percent SOC (20-35 mph with slow acceleration). Either the 2015 breaks the mold or I got something funky going on. I charged to 100% and drove to work this morning, about 17 miles and the SOC% on the dash says 85%. But dash is still showing 11 bars . Carwings also reports 11 bars. With the 2012, the first bar always seemed like the "thinnest" bar. Is this normal for 2015? Edit: So finally driving at lunch it dropped to 10 bars at an indicated 83% SOC (243 GIDs per LeafStat). Not as funky as I'd thought since I was right on the cusp of dropping to 10 bars. But still, bars 12+11 came to be about 13% previously, and 17% is a bit higher than I expected.